This wedding took place at the beautiful Cortijo de los Caballos and was beautifully organised and styled by Rachel Rose Weddings. The venue sets the atmosphere so wonderfully, that it is impossible for anything else that takes place to not do the same. It’s always nice to arrive at the Cortijo and find the guests mingling and having some pre-ceremony drinks and the groom also taking part and relaxing amongst friends and family. I then headed to the bridal suite to see how the preparations were going ie to see if the ceremony is going to start on time!! It’s also so lovely to see the bride and her girls relaxed, being pampered and excited to get the ball rolling. The ceremony was very emotional and started this way right from the start. From the bride crying down the aisle to remembering absent relatives, all emotions were running high. But the ceremony, as any balanced ceremony should, contained lots of laughter and humour too. 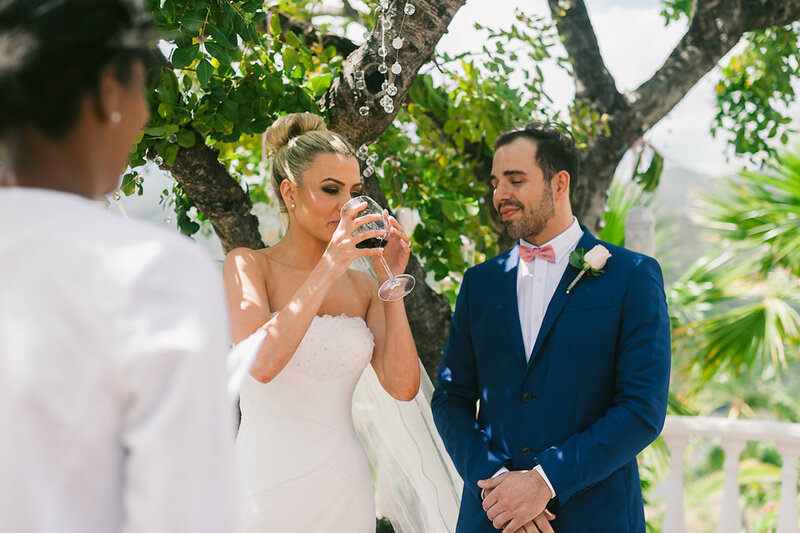 With heartfelt wedding vows and well chosen wedding readings that reflected them perfectly, the ceremony contained their personal touches from start to finish! Every year I do a handful of ceremonies for Dutch couples and I am always so blown away by how amazingly the Dutch can express their love for each other in a language which is not their own, and my Dutch wedding ceremony in Rincon de la Victoria, was much the same. Although, the ceremony was primarily in English because my level of Dutch is zero, I encouraged the couples to speak as much in their own language as possible ie their vows and readings etc. Their meaning of marriage however, was in English, as it is me that reads it out for the couple. And this is where I am so impressed by how they translate their feelings in to English, especially at this ceremony. And with those marvellous sea views, the setting could not have been better for this Dutch couple, who also presented me with the cutest wedding favours, including a miniature union jack suitcase with worry dolls to go inside and a lucky coin. Such a lovely, lovely couple who celebrated their special day with their closest family and friends and their five year old son. Being in a mixed raced marriage myself, I love it when a mixed cultural wedding takes place because the richness of the two cultures is so evident and make for a wonderful mixture of heritage, identities and personalities. This was no exception for the lovely Irish-English ceremony that took place at the gorgeous Cortijo Pedro Jimenz (again organised and style by Rachel Rose Weddings). This couple were so much fun and really embraced their cultural differences, the very things that obviously united them as a couple too. Their meanings of marriage were fab, as was their candle ceremony using sand from the local beach in Estepona. Celebrity or not, a wedding ceremony grounds us all. Although I have done quite a few ceremonies with the odd famous guest here and there, it’s certainly not everyday that the groom turns out to be famous. Even though for me, a ceremony is a ceremony no matter who the couple is, it was a nice surprise to find out that I would be conducting the wedding ceremony of British stand up comedian, Russell Kane. Amongst the laughter, which of course there was bucket loads of, there was some really beautifully touching moments that had both the bride and groom in tears. It really was a really charming and loving affair and it was nice to be reminded that celebrities are just like the rest of us! One of my much anticipated vow renewal ceremonies is yet to come but I cannot wait, as I love love love vow renewals. It is such an amazing honour to help couples celebrate their marriage and look back on how far they have come, usually with their children, if not grandchildren in tow. My next vow renewal will celebrate 15 years of marriage and the gifts of four beautiful children. How wonderful! ← Have you got the vow factor?